PACK & SEND is Australia’s leading and most proficient courier and freight provider. For domestic freight and courier’s services, trust the experienced team at PACK & SEND. Are you sending parcels within Australia? Are you shipping boxes interstate? PACK & SEND couriers Australia can cater to your needs. No matter what you need shipped, PACK & SEND have got you covered. PACK & SEND specialise in Australia-wide courier shipping. Our interstate courier, road and air freight services support all Australians, including business and personal use. We have a wide selection of cost-effective domestic delivery solutions, getting your parcel to all major cities of Australia, Sydney, Melbourne, Perth, Brisbane, Canberra and beyond. We create custom packing solutions that are tailored to your needs. On a tight schedule? PACK & SEND offer a No Limits philosophy, meaning you can get a Same Day or Next Business Day service, regardless of size. Moving to a new house, student moves, international relocations, estate moves or even office relocations, PACK & SEND can facilitate your needs. 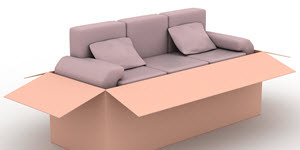 If you need to calculate the shipping of furniture or bulky items, speak to the experienced team at PACK & SEND. Offering cheap furniture shipping options, PACK & SEND can aid you with your move both domestically and internationally. Our meticulous and efficient courier and freight service and delivery network come with the capability to assist you in organising your next move! The team can help you with packing or can provide you with all the packing supplies you need for an easy do it yourself job. Unlike other removal companies, PACK & SEND will also cater for small moves that involve only a few items, such as a table, fridge or washing machine. An expansive network of transport options is at your fingertips; you can tailor our services to your needs whether that be moving one item or a houseful. Visit your local Service Centre, call us on 1300 668 000 or get a quote online today.